When school holidays begin, with two kids to entertain, I’m always looking for inspiration for new things to try. As a family photographer based in Walton on Thames, I get to meet a lot of great families and share ideas for kids activities in Surrey. Here are a few ideas that may be of interest to you too. This is a lovely new playgroup based in a one acre garden that is open every Tuesday morning until the 21 August. There is a veggie patch, greenhouse and giant trampoline for the kids to explore. If that isn’t enough there is a car to draw on and mud cakes to make! I can’t wait to try this one out, I know my two are going to love it. If animals are a big deal in your house then the lovely Elm Nursery might be worth a visit this summer. The children’s farm has free-roaming animals including micro-pigs, shetland ponies, alpacas and guinea pigs. Make sure you check out the cafe – the homemade cakes are delicious. It wouldn’t be summer holiday without a bit of PYO and this is one of our favourite children’s activities in Surrey. Crockford Bridge Farm is based in Addlestone and is a great way to spend an afternoon. In season there is lots of lovely fruit to pick and after all that hard work cool down with ice cream or drinks at Crockford Corner. The play area has one of the best swings I’ve ever tried (this one isn’t just for kids) and if that isn’t enough there is soft play and an Aquatic Centre at the neighbouring garden centre. This is a classic Surrey kids activity and one that always goes down a storm in our house. Once a month, the railway is open for train rides for children and adults on two seperate tracks. The volunteers who run the place are very friendly and a slice of homemade cake at the cafe is a must. Henry VIII had a palace in Surrey with it’s very own fishing lake. The palace no longer exists but the lake is still there and the new path that opened up last year leads you right there. Park up at Cowey Sale and take your nets to see if you can find anything. The path is great for cycling with kids and suitable for buggies. Did you know that the oldest working mill in Surrey is based in Cobham? No, me neither! It is based just outside the village and is set right next to the River Mole. The mill is open on the second Sunday of every month between 2pm- 5pm and is free to visit. Hopefully this has given you some inspiration for children’s activities in Surrey. Now if it’s rainy over the holidays, you might want to check out my ideas for rainy day activities for kids. My name is Katie Lister and I’m a Surrey family photographer with two kids, Sienna and Joey. 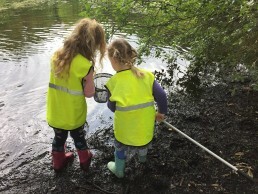 If you have any ideas for kids activities in Surrey that I can try with my kids, please do get in touch.